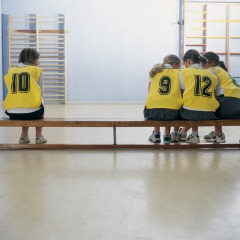 While bullying has a long and sordid history in American classrooms, a November 7, 2016 article  in The Nation asserts that the current surge is notable in two respects, both for the similarity of its targets - Muslim students, immigrants and children of immigrants, children of color, girls, and Jews - and the language used against them, leading some educators to suggest a link to Donald Trump and the "degraded course of this election season." According to a story  published on the website, OnlyNews.com, the weekend after the election, a girl's volleyball team from Archer City, TX (about 2 hours north of Dallas) was playing against a team from Fort Hancock ISD in Snyder, TX (a town on the Texas/Mexico border which happens to be 97 percent Hispanic) when students from Archer City starting chanting "Build a Wall!" and holding up Trump/Pence signs, along with large flags emblazoned with the phrase "Come and Take It!" - a reference to the Battle of Gonzales, the first military battle during the Texas Revolution with Mexico. Establish written codes of conduct. After two years of work with our global partners, MomsTeam Institute/SmartTeams has issued guides  for viewing on the web and for downloading and printing, for organizations working to implement the International Safeguards and for anyone supporting or governing organizations working with children, including guidelines for creating codes of conduct for staff and volunteers, children and young people, and parents and caregivers. Brooke de Lench is Executive Director of MomsTEAM Institute of Youth Sports Safety, Founder and Publisher of MomsTEAM.com, author of Home Team Advantage: The Critical Role of Mothers in Youth Sports (HarperCollins), and Producer/Director/Creator of the PBS documentary, "The Smartest Team: Making High School Football Safer." She can be reached by email @ delench@MomsTeam.com , and you can follow her on Twitter @brookedelench.